While I've already made four batches of yuzu-ginger marmalade (including one for Le Panier de Piu's December Cooking Party), there are still a few yuzu hiding around the apartment. While I'm saving a few for the traditional dunking in the bath on the solstice, I also thought I'd try my hand this year at yuzushu. The umeshu process had been quite straight-forward, and my hunch was yuzushu would be as well. 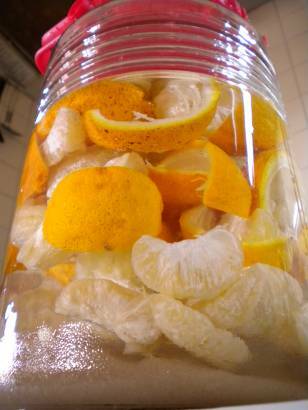 Pour sugar into the bottom of a clean glass jar (non-reactive containers are best in these situations), and pop the yuzu fruit and peel on top. Pour in the shochu. The recipe I mostly followed suggests removing the peel after one week or so, and the fruit after a month. Let it age in a cool dark place for six months to a year to become a fine liqueur or a tolerably tasty mixer. We'll have to see. Fruit - Yuzu is famous in Japan for many reasons, not the least of which is the tradition of popping it into the bath on the solstice. It smells fantastic and I can't imagine it's bad for you. While we didn't experience it last year, we plan to find ourselves bobbing about with those golden globes at our neighborhood sento. So, while I didn't make this batch on the solstice, it seemed like an appropriate moniker. Pith - I did not remove the pith. I've not removed it while making yuzu or mikan marmalade, and it hasn't been a problem. A little research also seems to show that orange pith is actually quite healthy and I'm betting yuzu isn't far behind. Sugar - In hindsight, I do wish I'd used the rock sugar leftover from the umeshu. I think it might dissolve a bit more slowly and evenly than the organic granular sugar used here. Meanwhile, I've still got a bag full of yuzu waiting for a purpose. I've considered juicing them, adding chilli pepper to the yuzu-ginger combination, or just making a batch of straight-marmalade. Or adding a bit to some apple jam stewing in the back of my mind for some time now. Suggestions are welcome, and could well warrant a jar of the concoction shipped to your door. Thanks for the link, Almir! I checked it out, and it does sound amazing. Perhaps we'll serve it up at our Christmas Lunch on Saturday. I might. It's getting to be time to make this year's batch, and I make one with the same amounts and one with a bit more sugar. FYI, I do recommend trying other fruits, too. We sampled the blueberry and rhubarb shus last night, and they were simply amazing...if I do say so myself.